The collection of highways traversing Queensland's Western Downs take the traveller on a journey which is rich in history writes Adrienne Costin. Look at a map of the Western Downs, an area of roughly 126,000 sqkm to the west of Brisbane and you'll find an impressive collection of highways as it is the hub for the road network travelling north/south and east/west in Queensland. Nine highways run through the region if you include the Carnarvon Highway, which starts at Mungindi on the southern border and leads north to the Carnarvon National Park above Injune, the Barwon which runs between Goondiwindi and St George and is named after the Barwon River, a main tributary of the Darling River, as well as the Moonie and Balonne Highways which are part of the Adventure Way. 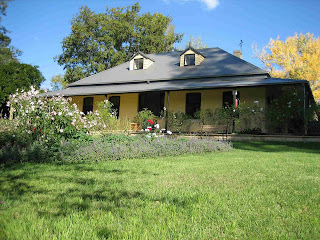 The Great Inland Way enters the Downs from the south at the tiny town of Hebel, population 28, home to a welcoming pub and the tearooms at the Crafty Yum Yum Café. Like the rest of the Downs, the land around the little township stretches leisurely to the horizon, sometimes framed by trees or dotted with lonely specimens who stand tall alone. The Hotel opened in 1894 and was a Cobb & Co stopover. The original village store, built three years later also remains and local legend also reckons the Kelly gang used the town as a hang out. Travel north to St George and 45km out of town watch the left for the signs to the Nindigully Pub, Queensland's oldest hotel which still stands in its original condition and location on the banks of the Moonie River. The pub's licence was issued back in 1864 when they brewed their own beer and rum. It's still a great place to for a quiet ale, even on days when special events like the Nindigully Pig Races and New Year's Eve aren't taking place. The highway continues on to Surat, the town from which the last scheduled Cobb and Co coach left before stopping forever at nearby Yuleba. This historic run is commemorated at the Cobb and Co Changing Station, a local landmark which is home to a museum, art gallery and 25,000 litre fresh-water aquarium. Nearby Roma and the surrounding countryside were first explored more than 150 years ago by Sir Thomas Mitchell. The unofficial capital of the region dates back to 1867 when it was named after Lady Diamantina Roma Bowen, the wife of the Governor at the time. This thriving rural town has plenty to offer the modern day visitor but history still plays a major role and one of its most popular attractions is the Big Rig, a fascinating tribute to Australia's oil and gas industry which includes a spectacular night show. This is a rich agricultural and farming area, and grapes have been grown here for many years. In fact, Queensland's oldest winery, Romavilla has been producing table and fortified wines since 1863 and proudly continues to do so. Even the trees are historic. The Avenue of Heroes is a heritage listed avenue of 138 bottle trees within the town which were planted as a tribute to soldiers from the district who lost their lives in World War 1. Mt Abundance Homestead outside town was the site of the first settlement in the region and was built in 1860. Visitors are still welcome. Follow the road north and you'll go right past the Carnarvon National Park, home of the spectacular Carnarvon Gorge with its ancient rainforest and some of the finest Aboriginal Rock Art in Australia. The Adventure Way is the link between Brisbane and Adelaide and includes two State highways as it passes through the Downs, the Moonie Highway, a 285km stretch of road from Dalby to St George and the Balonne. As can be assumed by it's name, the Moonie Highway passes through the tiny town of Moonie which was the site of Australia's first commercial oil field. It opened in December 1961 and despite being a relatively small field is still operational today. At St George the highway becomes the Balonne for 300km to Cunnamulla, mostly following the Balonne River. The Warrego Highway is the 744km stretch from Brisbane which enters the Downs at Dalby and leaves it past Roma at Mitchell on its way to Charleville. At the township of Miles between Dalby and Roma you'll find the Miles Historical Museum and more than 20 old buildings in a recreated township. Miles was originally known as Dogwood Crossing and like many of settlements in the area was established on a track blazed by Ludwig Leichhardt. Another historic experience waits outside the town at Possum Park where accommodation is offered in historic underground bunkers and restored troop carriers. The Leichhardt Highway, named after the explorer, begins in Victoria and enters Queensland at Goondiwindi and then heads north east across the state to the Capricorn Coast. Travelling north, take a left turn at the tiny settlement of The Gums and you'll come to Glenmorgan and Monty's Garage, a 1940s style auto garage which is now a Vintage Car Museum. While in town railways buffs should visit the End of the Line display in the Glenmorgan Railway Station. Gardeners and naturalists will also enjoy a visit to the nearby Myall Park Botanic Garden, one of Australia's oldest collections of arid and semi-arid native plants and the birthplace of the Grevillia plant "Robyn Gordon". 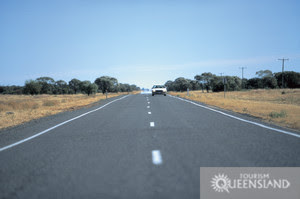 Goondiwindi, locally known as Gundy, is the start of the Gore Highway which runs for 210km from the Western to the Darling Downs through a rich patchwork of farming landscape. The area around Goondiwindi was settled in the 1840s by pastoralists and by the middle of that century had become an important administrative and commercial centre. The town is still most famous as the home of champion racehorse, Gunsynd, affectionately nicknamed the 'Goondiwindi Grey'. Coral Princess Cruises has released its new Kimberley & Across the Top of Australia brochure, with 2009 and 2010 dates and rates for Coral Princess's most popular cruise: a voyage exploring the remote Kimberley coast between Broome and Darwin. Next year, Coral Princess is venturing into the Kimberley by both land and sea, with a new, 24-night Kimberley Cruise & 4WD Expedition, combining the 10-night cruise and a 4WD tour through the Kimberley's rugged and beautiful interior. The Kimberley wilderness of Western Australia is three times larger than England with a population of just 30 000. The combination cruise/drive reaches areas that are largely inaccessible by other means. The 4WD journey travels the length of the legendary Gibb River Road,stopping at million-acre El Questro station to hike into Emma Gorge and soak in the hot pools of Zebedee Springs. Further along the road, Lake Argyle is the largest man-made lake in the Southern Hemisphere, with 18 times the capacity of Sydney Harbour. A highlight of the road trip is World Heritage-listed Purnululu (Bungle Bungle) National Park, and 'camping out' in style overnight at the award-winning Bungle Bungle Wilderness Lodge. style, the itinerary may vary to take maximum advantage of opportunities to venture ashore or to explore the many waterfalls, river systems, reefs and other natural attractions. Prices for the 10-night Kimberley cruise start at $6450 aboard the Coral Princess and $7750 aboard Oceanic Discoverer. The 24-night Cruise & 4WD Expedition starts at $12 610 aboard the Coral Princess and $13 910 aboard Oceanic Discoverer. Prices are per person, twin share. This includes the cruise and 4WD transport; all meals, lectures and services of expedition staff on board and group transfers. There are regular departures from both Darwin and Broome between April and September 2009. At the beginning and end of the season, the Kimberley cruise can be combined with an 11-night voyage, Across The Top of Australia, between Cairns and Darwin. Prices for this cruise start at $6450 per person. There is a 10 per cent discount for booking the two cruises together. It's difficult to know whether Victoria Cruises' Yangtze River product rates as true expedition and adventure or whether it follows a model developed by the great European river cruise companies. Travelling aboard Victoria's MV Queen, as I am right now, clearly it must fulfill both roles. The 90m, 4600 ton, 200 passenger vessel is designed purely for river travel along the busy waterway between Shanghai and Chongqing. Most itineraries spend their time among the famous Three Gorges and the city of Wushan. We gaze continuosly upward at the features and the dizzying precipes of the Qutang, Wu and Xiling gorges with occaional shore excursions into regions of the Lesser Gorges, the famous “Ghost City” at Fengdu as well as the great dam itself. When Victoria Cruises began in 1994, the landscapes were distinctly different. Thanks to the gradual rise of the river level since the controversial, mind-boggling Three Gorges Dam project, the old traditional villages along both banks have been replaced by unremarkable concrete apartments placed above the new waterline. The gorges themselves have largely escaped transformation except for the consistently higher river level, leaving their quite stunning geographic features for the guests aboard the small fleet of tourist boats plying the waters. Fishermen and farmers have turned tour guides and construction workers and there are many arguments for and against. Before setting out for this China cruise, consider your clients' preferences carefully. Food, cabins, facilities and service is superior to any other Yangtze Cruise company and compares favourably to Western standards. BACK in 1961 Elvis Presley rocked his way through a musical blockbuster that had him playing the role of a tour guide for a group of giggling American school girls and their teacher holidaying around Hawaii. It was called Blue Hawaii and was the story of ex-GI Chad Gates coming home to a dizzy Mom – bizarrely played by Angela Lansbury who was just nine years older than the 26-year old Presley at the time – and a bossy father who wanted him to go into the family's pineapple canning business. The independent Chad teams up instead with travel agent girlfriend Maile Duval (Joan Blackman,) and after singing and strumming his ukulele through a then movie-record fourteen rocka-hula songs inevitably marries her in one of Tinsel Town's most memorable wedding scenes on a barge on a picturesque Kauai lagoon. Fast forward to the mid-1990s and a Californian-born tour guide escorting a group that includes four Aussie girls on the Big Overseas Adventure, travelling from Vancouver through the Rockies and across Canada to New York. One of them, attractive Sydney brunette Amanda Stewart catches the eye of the handsome Shamus Watkins, and at the end of the tour they decide to keep in touch. 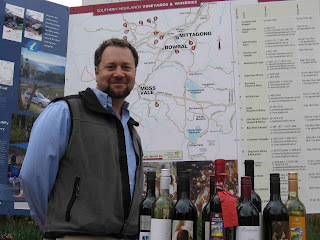 And while they now have each other and their jobs – Amanda as a legal secretary and Shamus a guide with Sydney's Bridge Climb – they share another mutual love: the Southern Highlands of NSW, and its emerging cool-climate wine industry. There's probably little wonder: Amanda's family has owned a small rural retreat at Canyonleigh in the Highlands for decades and it's been part of her life since a little girl, while Shamus grew up in California's famous Napa Valley wine country and worked in some of its best winery restaurants while not on the road guiding tour groups. And this month they've put their combined years in tourism, the wine industry and the Southern Highlands to good use to launch all-inclusive wine tours from Sydney to this emerging new wine region. 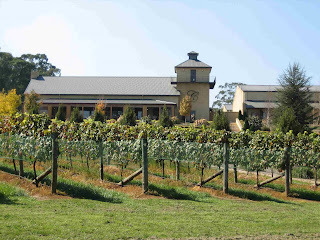 They've appropriately dubbed it Southern Crush Wine Tours and are initially including four of the region's twenty-plus boutique wineries in full-day tours, with pick-ups from several Sydney CBD locations for the trip to the Southern Highlands, which interestingly are an hour closer to Sydney than the Hunter Valley wine region. 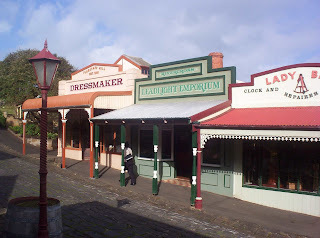 There is also a pick-up at the Southern Highlands Visitor Centre at Mittagong for those from areas other than Sydney wanting to join tours from there. Numbers are limited to a maximum of just twenty and guests are provided with a "tasting tool kit" comprising such things as information about each winery and their wine styles, tips on wine tasting, a history of the region, and food and wine pairing. Wineries visited have been chosen for the different experiences they offer, and the willingness of owners and winemakers to talk to Shamus and Amanda's guests about the region's award-winning light and elegant style wines. After lunch there's a visit to the historic colonial town of Berrima and its famous galleries, antique and curio shops, then Blue Metal Vineyard for a wine and Southern Highlands gourmet cheese tasting – cooler boxes are carried on coaches for guests to bring back cheeses or other gourmet food purchases – and finally Joadja Vineyards & Winery for a behind-the-scenes look in the winery and a tasting in the vineyard. Initially tours will run every Friday and Saturday, with plans for four or five weekly. Pick-ups begin at 7.30am in Sydney's CBD and coaches return at approximately 6.30pm; price including wine and cheese tastings, lunch and a professional guide is $149 per person. Phone (02) 8516 0031 or visit www.southerncrush.com.au for individual or small group bookings or full-coach charters for corporates or clubs. 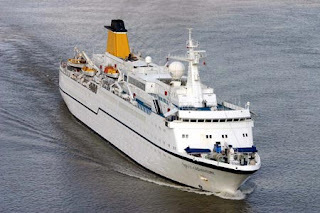 Opportunity still exists to join one of two voyages Orion is undertaking in February and early March 2009. Select from the 10 night Auckland to Port Vila expedition or the 9 night Port Vila to Rabaul voyage – or join them together for a memorable 19 night Voyage of Discovery along the Ring of Fire. Commence by exploring the picturesque New Zealand Bay of Islands before heading to the historic penal settlement of Norfolk Island and then on to the beautiful Isle of Pines in New Caledonia. Experience the true meaning of Melanesia's "Ring of Fire" with visits to the volcanic islands of Anatom and Tanna, highlighted by an exciting evening excursion to the rim of the crater of the spectacularly active volcano, Mt Yasur. The first voyage concludes in Port Vila, Vanuatu, providing convenient air access and accommodation for those leaving or joining the ship. Stay onboard for Espiritu Santo, where scuba divers will be able to experience an unforgettable dive on the world's largest accessible ship, the 22,000 ton President Coolidge, inadvertently sunk after hitting a US minefield during World War II. Enjoy the gentle sea breezes of Marovo Lagoon, snorkel the extensive coral reefs or feed the sharks at Uepi. More spectacular than any film set, Ngella Island features the unforgettable hulking remains of the doomed expedition ship World Discoverer, beached in 2001 after hitting a coral reef. Culturally fascinating, Orion's guests will enjoy a warm welcome at every destination, with plenty of music, uninhibited rhythmic dancing and singing and an invitation to join the locals in their beautiful villages. Intricate wooden and stone carvings, shell necklaces and woven baskets are all hard to resist - and buying locally means bargains abound. The second voyage concludes in Rabaul, Papua New Guinea, with a fittingly dramatic entrance to Simpson Harbour dominated by the massive Mt Tavurvur, a volcano still erupting today, long after it helped turn old Rabaul into a modern day Pompeii in 1994. Departs Auckland 27th February, 2009. 10 nights Auckland, Te Rawhiti Inlet, Russell (Bay of Islands), Norfolk Island (overnight), Isle of Pines, Anatom, Tanna, Port Vila (Vanuatu). Fares begin from $7,070 per person for an ocean view Category B Stateroom through to Owners’ Suites with French Balcony at $14,805 per person. Departs Port Vila 9th March, 2009. 9 nights Port Vila, Malakula, Espiritu Santo, Santa Ana, Ngella, Marovo Lagoon, Rabaul (PNG). Rabaul was known as the Pearl of the Pacific before being half buried in ash following cataclysmic eruptions by Mt Tavurvur and Vulcan in 1994 resulting in much of the town (and airport) subsequently being relocated to Kokopo. The residents of Rabaul are a hardy lot. There was another significant eruption in 1937 and if that was not enough to unsettle one that was followed by the Japanese invasion and occupation in WWII. The most recent significant eruption was in October 2006. Tavurvur remains active today with consistently spectacular and dramatic displays of power. When entering Simpson Harbour you will notice pinnacles rising from the waters – the remnants of the original volcanic plug of the flooded caldera that is now the magnificent harbour. Consider the enormity of the original volcanic activity that created this caldera compared to the (relatively) diminutive size of Mt Tavurvur. Heritage Cruise Line has released itineraries and fares for its first ship, the 58m Jayavarman, which will make her maiden voyage on the Mekong River next September. As previously reported, Heritage’s parent company, Saigon-based Trails of Indochina, is building the luxurious boutique cruise ship, which will have 27 staterooms with private facilities and balconies, at a cost of around US$4m. The eight-day cruise between Ho Chi Minh City and Siem Reap, called ‘The Lost Civilisation,’ costs from US$2,675 for a twin-share cabin. The three-day ‘Deep in the Delta’ cruise from Ho Chi Minh City to Chau Doc, which is situated in the Mekong Delta region of Vietnam close to the Cambodian border, costs from US$743 per cabin. There is also a five-day ‘Serenity Cruise’ linking Phnom Penh with Siem Reap and a four-day ‘Pearl of the Orient’ itinerary between Ho Chi Minh City and Phnom Penh. Shore excursions include visits to floating markets, bicycle rides to remote villages and a Vietnamese cooking class. I reckon it would be tough selling anything to do with Burma, yet the tenacity and optimism of Pandaw Cruises is inspirational. Resurrected in 1995 from the original Irrawaddy Flotilla Company of the 1860s, the gorgeously recreated vessels typically carry around 60 pax in nostalgic, teak-and-brass luxury. Traditional river cruising, European style, is normally far-removed from the adventure product, but with Pandaw there is a definite crossover. Itineraries include shore excursions, village visits, historic sites and cultural encounters in sufficient quantity to easily qualify as an adventure product. With luxury accommodation as a basis, passengers enjoy an extensive selection of cruises encompassing Myanmar, the Mekong (Cambodia and Vietnam) and now Borneo aboard a growing fleet currently comprising six vessels. The vision of the far-sighted and heritage-minded Scotsman, Paul Strachan, he regrets once being seen as an apologist for the Burmese regime but, according to fellow Scot Colin Donald, stoutly defends one of the few foreign owned businesses that puts money in the pocket of the ordinary Burmese. As if Burma needed another setback, Cyclone Nargis tore the Delta region apart in May. Instead of throwing his hands up in despair, Strachan activated his fleet as floating hospitals and supply vessels and was one of the few aid providers to make a measurable impact on the suffering of the God-forsaken Burmese. His humanitarian work continues. Cruise West (www.cruisewest.com), the global leader in small-ship exploration voyages and the largest American-owned cruise line, is reintroducing its Vietnam itinerary in 2009. Back by popular demand, Cruise West's Vietnam voyage will take place upon the company's flagship and most luxurious vessel, the 120-guest Spirit of Oceanus. The itinerary will give travelers the chance to experience Asian destinations such as Hoi An, Ho Chi Minh City, Hanoi and Hue while discovering Vietnam's architecture, art, and ancient shrines. Along the way, guests will sample traditional Vietnamese cuisine, enjoy beautiful dance, martial arts and colorful puppet theater. The 12-day journey commencing in Hanoi and ending in Ho Chi Minh City will depart on November 21, 2009, and includes tours along the Gulf of Tonkin - some 1,600 mostly uninhabited islands and islets; Hue, the Imperial City on the Perfume River; the temples and picturesque fishing boats of Nha Trang and more. Other highlights include the Cham Museum, a special private performance of traditional martial arts in Qui Nhon and UNESCO World Heritage Site Ha Long Bay. "Cruse West's Asian itineraries are an important component of our goal to be an international cruise line," stated Dietmar R. Wertanzl, newly appointed president and CEO of Cruise West. "The decision to reintroduce our Vietnam itinerary was an obvious one given the interest in the destination our guests continue to express." While onboard the SOO, Exploration Leaders and guest speakers will share information about the people and places visited throughout the itinerary. Cruise West's Single Share Program is available on the Vietnam itinerary, allowing single travelers who are willing to share a room with another single traveler of the same gender to pay the double occupancy fare on the cruise. Prices start at $5,649 for double occupancy rooms. An optional five-day Angkor Wat/Cambodia add-on includes tours of the Temples at Angkor Wat including the spiritual center of Ta Prohm, Tonle Sap Lake, a floating fishing village of homes, shops and deepwater rice paddies, Siem Reap and Phnom Penh. For additional information, a complete itinerary or to book the Cruise West Vietnam Cruise, call 1-800-296-8307 or visit (http://www.cruisewest.com/destinations/vietnam). Cruise West offers the opportunity to explore remote and distinctive destinations throughout North and Central America, Asia, South Pacific and Europe. Small-ship cruising allows for personalized experiences not offered by larger cruise lines. Guest capacities aboard Cruise West's nine ships range from 78-138. Guests may expect personal enrichment through insightful shore programs, onboard narrative and presentations by local experts from a wide variety of backgrounds. In addition, destination specific materials and an array of books are provided in the onboard library on every vessel. Cruise West considers it a privilege to access some of the world's most pristine wilderness areas and culturally rich countries. With this in mind, Cruise West views itself as good stewards and encourages crew and guests to act responsibly with respect to the environment and diverse cultures visited. For more information, call 1-800-296-8307 or visit www.cruisewest.com. IT'S a bit like the mystery of the one sock in the washing machine. There are signs everywhere warning of the presence of bears. And how dangerous bears can be. 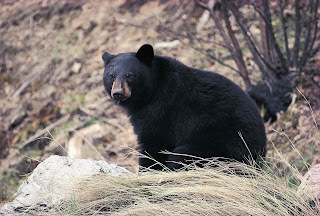 The friendly staff at the Fairmont Jasper Park Lodge constantly repeat the warnings, and fellow guests tell us of their Close Encounters of the Bear Find in the surrounding spruce forests. But we've been here a week and we've walked bush trails, and hiked lake frontages and not a bear have we seen. Are all these signs and all this talk, we start to ask ourselves, just part of a big publicity stunt to get us – and others from around the world – to this vast Canadian wilderness? We even find on the Travel Alberta website a "Bear Update" that tells us where bears have been seen – and again how dangerous they can be. "They're on the move now that Spring is here, looking for berry crops," it warns. Adding that campers should ensure that any food, garbage and recyclables are stowed away and bear-proofed. So, hey, in the hope of seeing bears, cameras slung around our necks, we go in search of a camp ground. We find several, but still there's not a bear to be found. Maybe they've become wise to all that bear-proofing of what was once easy pickings? But there's plenty more to be enjoyed here in this most northerly and largest National Park in Canada's famous Rockies, and we decide to finish our stay with an early morning round of golf – after all, the Jasper Park Lodge has been listed as best golf resort in Canada. But even here we're thwarted, for just as we're about to tee-off next morning, who comes ambling down the fairway to put us off our swing? Not one, not two, but a whole damn family of them: Bears - Mum, Dad and their coupla kids. Wandering along in a world of their own, stopping occasionally to sniff the air and sensing we – now rapidly retreating – human intruders. We take shelter in the car and click away to our hearts content, telling anyone who'll listen that it was worth a week's wait for this magical moment. And we guess that really, while that magic half hour will remain with us forever, it's the spectacular surrounding Rockies that is the big attraction here. "A little bit of heaven," are the words we hear over and again as we wend our way across to Lake Louise, where we pinch ourselves and decide that it was here the WOW factor was created. 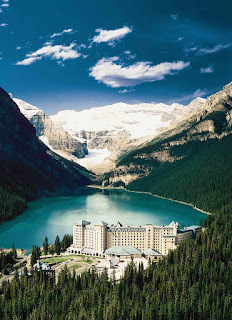 Amid the craggy snow-capped peaks that tower into the skies, is the fabled Lake Louise, and next to it and beside a massive glacier, is the very indulgent Fairmont Chateau Resort: it doesn't come cheap, but even if you're staying elsewhere its well worth visiting the hotel for a drink in one of its bars, or a meal in the restaurant for the reward of its million-dollar views – no, MULTI-million dollar views. And for a walk around the lake and onto Victoria Glacier – and a bracing diversion 3.5k's along trails first opened into the Rockies in the 1890s to the remarkable Plain of Six Glaciers Teahouse. This extraordinary place was built of local stones gathered-up by a Swiss artisan for the Canadian Pacific Railroad in 1924, and to this day still has no electricity or gas, the kitchens that turn out the most marvellous always-warm scones, jam and cream, tea, coffee and other refreshments relying on an ancient fuel stove. And just as they did back in the 1920s, staff bring-in fresh supplies daily by backpack or on horseback. 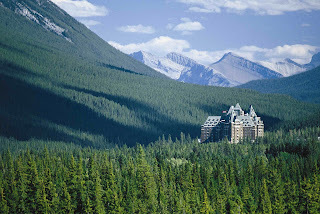 The Fairmont Hotel chain also have a luxury property at Banff Springs in neighbouring British Columbia that was built for the well-heeled traveller of the early 20th century venturing to the largest accumulation of snow and ice south of the Arctic Circle in the Columbia Icefield. Amongst the highlights of adventures here is Brewster Tours' million-dollar ice-terrain vehicle, Ice Explorer onto the ancient Athabasca Glacier that stretches over six kilometres long and a kilometre wide. For a Canadian Rockies holiday ask travel agents or Canada & Alaska Specialist Holidays on 1300 79 49 59 about packages incorporating Fairmont Hotels and Lodges. Spirit of Adventure is giving cruise-goers extra value with its discovery cruise packages to some of the world's more unusual destinations in 2009, by including guided excursions to main attractions and landmarks in the majority of ports to be visited by its ships, Spirit of Adventure and Quest for Adventure that has just come out of a multi-million (British) pound refurbishment. As well onboard guest speakers who specialise in subjects from archaeology and history to local traditions and food and fine, will join these half- and full-day excursions led by local professional guides. Cruiseco, a consortium of cruise-specialist travel agencies Australia-wide that represents Spirit of Adventure exclusively in Australia, has just released a 48-page brochure that details a near-50 seven to 21-night cruises in 2009. They will embrace destinations as diverse as the Canary Islands, the Antarctic, Brazil, the Caribbean, Africa, Iceland, the Norwegian Fjords, the Mediterranean, Far East, Indonesia, Borneo and vineyards regions of France. All meals, nightly entertainment, onboard gratuities and excursions in most ports are included; both ships feature casual dress most evenings with a choice of main Dining Room or indoor/outdoor buffets with open seating. Cruiseco has big Early Bird savings with prices from just $1970pp from a 7-night Canary Islands cruise aboard Spirit of Adventure from Funchal in Portugal's Madeira Islands through five ports to Santa Cruz on Tenerife – including wine with lunch and dinner on this cruise; air is additional. Prices are subject to currency fluctuations. 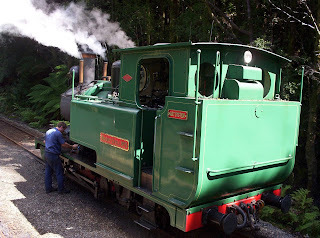 THE Mt Lyell Mining Company had good reason for the motto it affixed to the front of the first locomotive it ran from Tasmania's western port of Strahan to it's copper mine thirty-five tortuous kilometres away in the wild coastal hinterland. It read "Labour Omnia Vincit," Latin for "We Find A Way Or Make It." It was March 1897, and today there's every chance that even with 21st century technology no company would be foolhardy enough to even contemplate a railway like that of the Mt Lyell Mining Company. For here was a line whose locos using the then-revolutionary Abt Horizontal Cog-wheel System to traverse tracks that in places climbed mountains at almost-impossible 1-in-16 inclines, crossed some of the most ingenious hand-built bridges in railway history, and ran through cuttings hand-dug 20-metres deep through rock and clay – one alone requiring the removal of 80,000 barrow-loads of rock. And all this amid confronting conditions that included torrential rain, ice, bushfires, floods, countless snakes and millions of leeches. 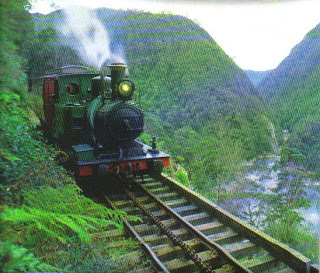 But somehow despite it all, when Mt Lyell in the early 1900s became Australia's largest mine at the time, the unique little narrow-gauge railway chugged away for 67-years, "truly earning its keep" the company said, before finally being closed in the 1960s. Today it is running again, the line having been re-opened in 2002 at a cost of $30m from the Federal and Tasmanian Governments and with huge public support – and with two of its original five Abt locomotives internationally recognised as the world's oldest restored working steam locos. It took a special breed to build the Mt Lyell Railway, both in the field and in the boardroom. Surveyors cut 500-kilometres of tracks through the wilderness before finding a suitable route for the line after gold, silver and then copper were found by adventurous prospectors who followed river courses into the seemingly-impenetrable hinterland. Those surveyor's reports back to the boardroom told of impassable mountains and rainforests so dense the sun never touched the earth, of sudden floods washing away camps and equipment, of lightning-strike wildfires, and of ravines just twenty metres wide and little deeper, that would take a day to cut a track down one side and another day to climb the opposite. But company directors, dubbed by one historian as "lion hearts fired by wild optimism," were determined to press ahead, and announced their railway on November 24 1892. Vast teams of navvies contracted to build the line were mostly inadequately outfitted for the weather and terrain, and to compound their misery lived for weeks on end on a monotonously unbroken diet of canned food; hundreds became ill and walked away as soon as they had enough money for a steamer fare back to the mainland. Thousands of trees were felled by axe and cross-cut saw and turned into timber for hundreds of thousands of rail sleepers – and over forty bridges that made up over six per cent of the length of the line. And the longest bridge, a 110-tonne, 43-metre iron structure was shipped out from England. To get it into position across the King River it was lowered from the ship onto a high trestle mounted on a barge, which was then towed into position and weighed down with thousands of sandbags that sank it low enough for the bridge to settle on its concrete abutments, and for the barge to float free. Today thousands of visitors from around the world ride the restored Mt Lyell Railway that originally hauled copper ingots from smelters at Queenstown in the mountains, and also carried hardy pioneer passengers, 35km to Regatta Point at Strahan on the coast. Now dubbed the West Coast Wilderness Railway it's one of the world's great wild-country train rides, with stops at several historic stations and sites along the way, and in places seeming to cling precariously to vertical cliffs that overlook wild rivers raging hundreds of metres below. 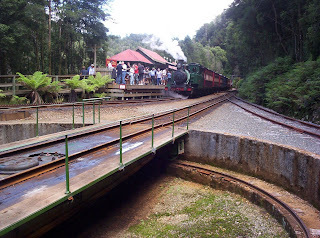 Onboard guides tell the history of the original railway, the unique Abt system, the restoration of the line, engines and passengers carriages, and point out places of historical importance: one-way by rail and the other by coach takes approximately five hours and costs from $123pp. Book through Federal Hotels 1800 420 155. STANDING at the station, high in Tasmania's wilderness. WORLD's oldest restored working steam locomotive. Returned to its pristine condition, the Hapag-Lloyd expedition cruise ship will be leaving the dockyards of the Japanese city of Yokohama on October the 10th. For two whole weeks, the ship was subject to extensive renovation, modernization and other additional service offerings. The very first guests to benefit from this are the participants of the “Knowledge Expedition” to Japan, Korea, Taiwan and China. Not only can BREMEN passengers look forward to a first-hand encounter with the treasures of Asian culture and the support of renowned speakers familiar with the area but to numerous improvements on board as well. Additional computers and Internet connections, new carpeting, bathrooms and furniture are but some of the new features. All cabins have also been furnished with new flat screen TVs and converted to non-smoking cabins. A new Cruise Sales Area near the front desk and the renovation of the public convenience facilities round off the refurbishment of the BREMEN. Just prior to the commencement of the renovation, the international renowned “BERLITZ Cruise Guide 2009“ awarded the BREMEN with a 4-star rating. Shallow draught, the highest ice class for passenger ships (E4) and twelve Zodiacs, characterise the BREMEN as an expedition cruise ship. The ship has been designed to sail through narrow fjords and rivers or to land in hidden bays. There is no better way for the max. 164 guests on board to experience such an intense sense of being at the core of it all, than for instance during a cruise through the Antarctic from New Zealand halfway around the white continent to Tierra del Fuego. This semi-circumnavigation is provided by very few ships, offering up-close encounters with majestic table icebergs in the Ross Sea, whales, gigantic colonies of Adelie Penguins and research stations. The BREMEN also displays many of its strengths on the upper reaches of the Amazon in Peru: Equipped with Zodiacs and local guides, guests can penetrate the very heart of the jungle and partake in discovering river dolphins and tapirs, Indian villages and colonial cities. Expedition Semi-Circumnavigation (BRE0901) from Bluff to Ushuaia, 11/1/2009 to 15/2/2009, 36 days, from 17,350 Euro. Expedition Amazon (BRE0907) from Iquitos to Belem, 26/4/2009 to 12/5/2009, 16 days, from 8,238 Euro. 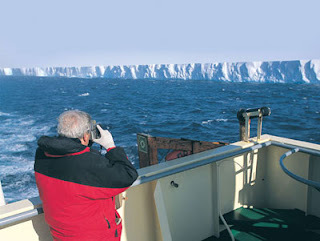 For more information on Hapag-Lloyd Cruises’ exciting destinations and itineraries visit www.hl-cruises.com. Further information is available from your travel agent or from Hapag-Lloyd Cruises, Ballindamm 25, 20095 Hamburg, Germany, phone: +49 / 40 / 3001 4600, fax: +49 / 40 / 3001 4601. For bookings, inquiries or to request a brochure in the US call 877-445-7447. To download the latest images of the ships, visit www.hl-cruises.com, link “press”. Due to the popularity of the unique Northern Fijian Dateline Cruise, Captain Cook Cruises has added and extra departure date to the schedule for 2009, bringing total scheduled departures to eight. I'm conscious, as ever, that a lot of water has flown under the bridge since my last message. Since then I've been working hard at an edit of my Diaries 1980 -1988 in time for publication next year, whilst watching Archie grow up and trying to come to terms with my identity theft by a hockey mum in Alaska. And no, Sarah Palin is not my sister, daughter or alias. And I'm Sahara Palin not Sarah. After a grey old summer in London I'm about to set out for the heat again with some of the old team, on a new journey, currently called 80 Days Revisited, which will hopefully be shown as a one-hour special on BBC-1 around Christmas. At the same time Weidenfeld and Nicolson are publishing a new edition of Around The World In Eighty Days. Because some of the original pictures have gone missing in the twenty years since, we've trawled the archives and found some great new photographs and the book will be completely re-designed. I've written some new material, including a new preface and a short new chapter describing our return visit. So here, good and patient website friends, is the latest on the latest journey. In Eighty Days Revisited we may not be going back to the Reform Club or ballooning over the Rockies, but we will be returning to the scene of one of the best-remembered sequences of any of my travel adventures, the dhow journey From Dubai to Bombay, episode three of Around The World In Eighty Days. As we sailed agonisingly slowly down the Persian Gulf on board one of world's oldest surviving traditional sailing ships we formed a unique relationship with our Indian crew. Mutual incomprehension gradually gave way to friendship and affection, as we accepted the fact that our lives, and the success of our journey Around The World In Eighty Days was in the hands of this band of ragged, under-paid sailors from Gujerat. After a week at sea together, I found our farewell at Bombay to be one of the most emotional moments on all of my travels. As I said on film at the time : "It's almost impossible to accept that I shall never see them again". Well, twenty years after we waved each other good-bye in the crowded waters off Bombay I'm trying to prove that nothing is impossible by setting out on a search for the crew of the Al-Sharma. With the same cameraman who shot the original dhow journey we shall re-visit Dubai and meet those who found us the dhow in the first place, and then on to Bombay, now Mumbai, to see if, in the intervening twenty years that great teeming city has changed in more than just name. From Mumbai we take the over-night train north and west to the little town on the Indian Ocean from where many of Al-Sharma's crew hailed. What happens here is far from certain, but I'm hoping to make contact with as many as possible of my old ship-mates. If all goes well we'll renew a unique friendship by sitting down together to watch, marvel and laugh ourselves silly at our adventures of twenty years' ago, when, together, we made our slow but happy way from the Middle East to India. This return journey, the first I've ever attempted, will be as much of a challenge as the originals. There are plenty of if's and but's on the way, but, for me, and hopefully for you, this promises to make Eighty Days Revisited all the more exciting. Ecoventura Executive President Santiago Dunn is a bright spot in today's global tourism arena. He's been working quietly in Ecuador on earth matters since 1990 from the Guayaquil headquarters of his family-owned company that ferries nature lovers into the fragile eco system of the Galapagos Islands on small, cutting-edge-green vessels. While afloat and offshore the minutiae of human footprints, both foreign and indigenous, and their impacts are assessed by Dunn who believes it's possible to elevate consciousness levels around the world by allowing privileged travelers to see places like The Galapagos and in so doing learn how important it is to protect the environment. In summer 2007 UNESCO put the Galapagos on its World Heritage sites risk list, citing alien species and pollution from tourists and immigrants as key issues. Dunn views this as a positive step "because it will raise awareness so that corrective measures are taken." Meanwhile he is modifying the engines on his fleet of four expedition yachts to create hybrid boats that will run by diesel and solar/wind energy. This ground-breaking technology will charge all electric/lights/appliances/bridge equipment and reduce fuel consumption by 10-20 percent. This conservation is in addition to the energy savings already realized though an operation policy that reduces engine RPMs. "This very new technology has only been used to date on small private boats and not yet on commercial vessels," he says, noting that $100,000 was budgeted for a one year test/trial on one of his yachts before refitting his entire fleet. The target goal is to have full implementation by 2011. This project and other work he has done offer a case study in best environmental practices. His mission for Ecoventura, that annually transports nearly 4,000 passengers, is to inspire others, including his passengers, to be part of the solution for the issues facing tourism in The Galapagos. "We want to give our passengers the assurance that Ecoventura has taken every measure to ensure that they enjoy a safe, thrilling adventure without harming the unique wildlife or the fragile environment. We all live in this world and breath the same air; the least we can do is try to preserve it for our children and the generations to come," says Dunn. - Since 1999, through a series of targeted projects, he has led Ecoventura to become the pacesetter in establishing the standard for responsible and sustainable environmental practices. - In 2000 Ecoventura became one of the first recipients of SmartVoyager, a voluntary environmental certification developed by New York-based The Rainforest Alliance and Corporacion y Desarollo from Ecuador. The program gives a "green seal of approval" to tour boats that comply with requirements to tread lightly on the area's fragile eco-system. - In 2005 he received the prestigious Individual Sustainable Standard-Setter award for making a significant contribution to environmental conservation and sustainability. - In 2006 Ecoventura, in partnership with NativeEnergy, became the first Carbon Neutral operation in Galapagos (and Ecuador). - In 2007 Ecoventura partnered with the World Wildlife Fund (WWF) to create the Galapagos Marine Biodiversity Fund which targets environmental education and marine conservation by strengthening the local communities' ability to manage natural resources. Megan Epler Wood of Burlington, VT, head of EplerWood International, a consulting company that advises regions around the world on sustainability issues, notes that Santiago Dunn has made Ecoventura one of the most environmentally conscious travel companies in Ecuador, one which is admired by its passengers and travel companies globally. "By partnering with NativeEnergy to offset carbon emissions, he is investing in the future of our planet by bringing corporate travel industry dollars directly to the development of new wind turbines on native lands and other renewable energy sources," she says. "What is really significant," she adds, "is that Dunn is not waiting for his passengers to "opt-in" to an offset program; he is paying the full amount for offsets upfront to ensure his company is carbon neutral. " To receive a copy of Ecoventura's 2009 catalog as well as information on tours to the Galapagos Islands, call toll-free 1.800.633.7972, or e-mail info@galapagosnetwork.com. To access current rates, schedules and itineraries you can log onto www.ecoventura.com/. Founded by Spanish conquistador Francisco Pizarro in 1535, as La Ciudad de los Reyes, or ‘The City of Kings’, Peru’s capital Lima, is an enchanting city which is guaranteed to capture the hearts of everyone who visits there. This undeniably cosmopolitan city blends the excitement of a modern bustling metropolis with a strong dash of old world charm. This blend of ‘old and new’ will be apparent upon walking through the city you will see fourth-century Pre-Columbian ruins which are nestled in the long shadows of office towers, and Spanish Colonial buildings line the historic central square. La Catedral or the Cathedral is a must see attraction, originally constructed in 1555 this central landmark still stands even after suffering earthquake damages twice in its history. Lima is the gastronomic capital of the continent, which boasts a range of delectable dining options ranging from suave seaside restaurants to hole-in-the-wall eateries; the city caters to every taste and budget. The capital’s world renowned cuisine fuses Andean and Spanish culinary traditions, as well as some African, Asian, French, Italian and Muslim cuisine. The two most famous restaurants in Lima are the Rosa Nautica and the Costa Verde, both located on the sea front and both specialising in fish. Don't leave the city without trying traditional Lima dishes (criollo), including Ceviche which is raw fish marinated in lemon juice and chilli or the distinctively sweet mazamorra morada (a purple corn pudding). Lima has an exciting entertainment centre with bars such as San Isidro's havens for the modern elite to Barranco's cheerful and inexpensive stomping grounds. Weekends from January to March also see the fresh-from-the-beach summer crowds heading down to Kilometer 97 on the Panamericana for the nightlife. On August 30, the locals celebrate Santa Rosa de Lima, with a giant street procession honouring the patron saint of Lima and the Americas. El Señor de los Milagros (Lord of the Miracles) is heralded on October 18 by a huge religious procession where locals clad in purple clothing take over the streets in celebration. In late July, the entire country is turned upside down as Peruvians celebrate Fiestas Patrias (National Independence Days), and Lima is no exception, with lively street parties and dancing. Tourists who are planning to visit Lima are faced with a task that at best could be described as challenging and that is deciding which time of year to visit the capital city. From April to early December, a melancholy garúa (coastal fog) blankets the sun in a fine, grey mist. Come December, however, the sun shines through and Limeños (Lima locals) head in droves for the beaches. Warm temperatures (accompanied by high humidity) continue through to March. The best time to visit is in March and April, when the sun is still shining, or in early to mid-December, before it gets too sticky. This Orion Voyage of Discovery visits one of the most extraordinarily bio-diverse regions on Earth. The Moluccas, once known as the Spice Islands and now Maluku, is a rarely visited collection of islands situated just north of Australia between New Guinea and Timor. Few outsiders ever set foot here. Being part of Wallacea, the legendary deep water area that separates the Australian and Asian continental plates, it is home to many unique flora and fauna species, particularly birdlife. Towering volcanoes rising from the depths of the sea, stunning islands, vibrant reefs and ancient cultures mark this amazing expedition. Magellan and Vasco da Gama opened the way for Europeans, building a profitable trade based on rare spices including cloves, nutmeg and mace. Archaeology has shown that more than 3000 years ago cloves from the Moluccas were traded in Persia and the Romans were able to buy spices from the remote east of Indonesia. The island of Alor is a must-do destination for adventurous scuba divers, the coral reef complex being in pristine condition - while ashore, the predominantly Christian villagers are friendly and their culture strong. The existence of Moko drums, not found in large numbers anywhere else in Indonesia, can be traced back to the Dongson period in Vietnam around 350 BC. 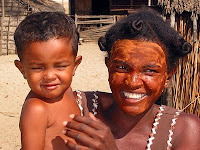 The residents of Sumba, an uplifted coral limestone island once known as Sandalwood Island by early European traders, retain a strong cultural heritage resistant to the outside influences of Christianity, Hinduism or Islam. Orion's guests will be welcomed by Sumba villagers wearing traditional woven ikat fabrics to see imposing ancient stone carvings and megaliths that adorn the entrances to Sumba villages. Orion's guests will see pre-historic creatures at world renowned Komodo National Park, established in 1980 to conserve the unique Komodo dragon. These imposing lizards are among the world's largest reptiles, growing to over 3 metres long and weighing over 70kg. Remote Pink Beach, so named because of crushed red organ pipe coral sand, is perfect for swimming, snorkelling, sea kayaking or just relaxing on the beach - options available to make the most of time spent on this stunning beach. Sitting just offshore from Sumbawa, opposite the towering volcano of Tambora, Satonda is an uninhabited natural paradise. The island itself is an emerging volcano featuring a lake that has formed in its crater. Hundreds of fruit bats call Satonda home and at dusk the sky turns black as they leave their roosts for the evening. Kenanga, a small fishing village on the coast of Sumbawa, provides another chance to experience culture and lifestyle on this fascinating voyage. Mix with the local people and visit the school and a local fish hatchery. Tambora volcano, towering over the coast of Sumbawa, is known for the largest eruption recorded in history. This Orion Spice Islands Voyage of Discovery has caught the imagination of Orion's Expedition Team. The heady blend of local culture, European discovery, geology, unique flora and fauna all wrapped and presented in a series of beautiful islands largely lost in time promises to be a voyage of a lifetime. Spice Islands Adventure – 10 September 2009 - 9 nights. Darwin, Maluku, Alor, Waingapu (Sumba Island), Komodo, Satonda Island, Sumbawa, Bali (Benoa). The cataclysmic volcanic eruption of Tambora in April 1815 was the most powerful eruption in recorded history; greater even than the legendary Krakatoa eruption of 1883. Tambora's resulting volcanic cloud lowered global temperatures by as much as 3 degrees °C, and a year later most of the northern hemisphere experienced sharply cooler temperatures during the summer months. In parts of Europe and in North America, 1816 was known as "the year without a summer." Ranked #2 expedition cruise ship in the world in the 2009 Berlitz Cruise Guide, Orion is the world's latest and Australia’s only purpose-built luxury expedition cruise ship. For reservations or to obtain a brochure call Orion Expedition Cruises: 61-2 9033 8777 (Sydney callers) 1300 361 012 (regional and interstate) or your travel agent. Lindblad Expeditions, which offers expedition cruises in tandem with National Geographic, shows no signs of stopping when it comes to expansion of its fleet and commitment to global research opportunities and environmental stewardship. At a press briefing today at New York's Brooklyn cruise port aboard National Geographic Explorer -- an ice-class polar expedition vessel, which just launched this August -- Lindblad Expeditions Founder and President Sven Lindblad announced that the company is working with National Geographic on the development of yet another ship, which will be used to explore underwater wrecks. Though details are scant thus far, we do know that Dr. Robert Ballard, an oceanographer long associated with National Geographic and perhaps best known for his role in the discovery of the sunken Titanic, will be heading up research aboard the vessel. Cruise Critic caught up with Ballard at the event, who told us that he's on his way to see the ship next week in Bodrum, Turkey -- a hotspot for underwater archeologists and divers, and home to the Bodrum Underwater Archeology Museum and Institute of Nautical Archeology. The ship will eventually accommodate passengers for a unique expedition experience. At this point the vessel's not ready for guests and there are no details on what kind of experience could be created for cruisers. We'll keep you posted. Lindblad says it will also send a group of scientists to the South Pacific next year aboard a small sailing yacht to document the region's reef system. Pandaw River Cruises in July will initiate a new expedition cruise on the Rajang River in Sarawak, Malaysia, on the island of Borneo. The Rajang River is the longest river in Malaysia, traveling some 450 miles across Borneo from Sarawak into Indonesian Kalimantan. The Rajang presents a jungle experience that traverses the second largest island in the world after Greenland. The land is peopled by the Iban, who practiced headhunting into the 1950s. On July 1, the new 60-passenger Orient Pandaw will start a series of eight-night cruises from Sibu to the Pelagus Rapids and beyond up the Baleh River. Shore excursions include a visit to Iban longhouses, boat trips up tributary rivers, a walk about the vestiges of the colonial Brooke Raja that ruled Sarawak for 100 years, tours of pepper farms and fruit plantations, and a trip to weaving workshops. Jungle treks, for all levels of walker, are among the highlights of this cruise. The Orient Pandaw, an up-market replica of a colonial river steamer, started its maiden voyage on Sept. 29 from Saigon on the Mekong River. It has 30 staterooms on two decks. There’s also a restaurant, bar, café, spa and a sun deck. It is the fifth vessel to join the Pandaw fleet of river boats. Main deck cabins are $2,248 per person; upper deck is $2,495 per person. Rates include shore excursions, all meals including snacks, an open bar (for locally manufactured spirits), evening entertainment, transfers in Sibu and port charges. Pandaw recommends that guests add on a two-night stay in Kuching, which is easily reached from Singapore, Kuala Lumpur and Brunei. Pandaw, which specializes in small-ship cruising to exotic destinations, has been in operation since 1995. Its vessels ply the rivers of Southeast Asia including the Irrawaddy and Mekong rivers. The U.K.-based company is owned by Paul Strachen. Pandaw River Cruises raised more than $500,000 in Burmese aid following the recent cyclone disaster. For more information, call 800-798-4223 or visit www.pandaw.com. Few places remain such a closely guarded secret as the Kamchatka Peninsula in the Russian Far East. Hidden from the world for most of last century due to its strategic military location, even Russians needed special permission to visit the region prior to 1990. Behind this secret curtain, nature has flourished, resulting in a vast and pristine wilderness described by Lonely Planet as ‘one of the world’s most beautiful regions’. Fire-spitting volcanoes cloaked in ice dominate the landscape; remote indigenous tribes live as they have done for centuries, while rivers filled with salmon attract the highest concentration of brown bears on the planet. Teeming with an astounding diversity of wildlife including whales, sea lions, otters and birds, against a backdrop of wildflower-filled meadows, verdant valleys and towering mountain ranges - the Russian Far East is an adventure lover’s dream. Australian-owned expedition cruising company, Aurora Expeditions, invites you to uncover the majesty and mystery of this remarkable region on one of its three voyages departing in 2009. Travelling aboard the ice-strengthened 100-passenger Marina Svetaeva, the three expeditions will explore secluded islands and sites that would be impossible by any means other than by ship. The 14-day ‘Ring of Fire’ expedition to the Kuril Islands and Kamchatka departs on 11 July 2009 from Sakhalin Island in Russia and travels through the islands that lie like stepping-stones between Japan and Russia ending in the town of Petropavlosk. The second 14-day ‘Bering Sea Explorer’ expedition to Kamchatka and Chukotka departs from Petropavlosk in Russia on 24 July and visits the Commander Islands, Karaginsky Island, the Chukotka Coast and Arakamchechen Archipelago, and some of the least visited wilderness areas on Earth. The final 13-day ‘Arctic Ocean Discoverer’ voyage explores the Bering Straight and remote Wrangel Island, travelling high above the Arctic Circle where few have ventured. The voyage departs on 6 August 2009 and begins and ends in Nome, Alaska. Prices for all three voyages start at US$5,490 per person and include accommodation and use of all public areas on board the ship, all meals, guided shore excursions, lectures with expert naturalists and historians, and all port taxes. Sea kayaking is an additional option. I'VE been trying to talk my mate Ron into writing a book. Because Ron was an ambassador. Not any old ambassador, but a special ambassador. For a hotel. His job was to look after the VIP of VIPs, people like royalty and business tycoons, and film stars and entertainers and, yes, visiting ambassadors. And once an elephant. Name a name and Ron can tell you something about the person behind it – after all he spent 32-years at the home of VIPS, the very swishy Regent Beverly Wilshire, of Pretty Woman fame, on LA's best-known street, Rodeo Drive. Ron Howard was the hotel's Night Manager. And because of the hours he worked he found himself handling some intriguing situations, and often fielding some weird requests from those who'd maybe had an extra glass or three in the course of the day, and now needed urgent assistance in the passion of the resultant moment. And no matter how whacky some requests sounded, or whom they were made by, Ron always seemed able to come to the rescue with goods, services and, yes, shackles. So diplomatically so, that many appreciative guests started writing not to the General Manager or other executives with requests for special favours upon their arrival, but directly to Ron. And the needs of that elephant. The dumbo thing had got stuck in the hotel's lift doorway on the way out after starring in a corporate promotion in the ballroom, and despite everyone's pushing and shoving, couldn't be budged. Come Ron to the rescue - with a packet of peanuts. He simply scattered them across the carpet and, hey presto, one baby elephant takes a deep breath and walks out for a feed. Now that's real ambassador stuff for you. And he's been called on to diplomatically resolve diplomatic situations: when Britain's top pop group at the time chucked a party and got into a food fight, wrecked a chandelier and generally trashed the room, were they thrown out? Nah. Ron "had a bit of a chat" with the lads' manager and got a cheque for the damage, plus a promise they'd address their behaviour better in the future. And as a special hoot when Frank Sinatra celebrated his 55th birthday at the hotel, instead of a blonde bimbo popping out of the over-size birthday cake, Ron arranged to have Sinatra's mate, Sammy Davis Jnr do it… while on another occasion for a charity fund-raiser he set-up a half-size soccer field in the ballroom, and asked Pele to launch the night by kicking the ball from one end of the artificial turf into the goal at the other. Not to be out-done, another participant tried to replicate this skill, but put the ball through a $30,000 Venetian-crystal chandelier. "I couldn't smooth-over that one," Ambassador Ron later told me. "It was our General Manager." 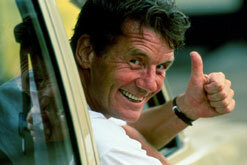 Ron also got hold of a Mariachi band to surprise an entourage of visiting Mexican V-VIPs, had the entire Boston Pops Orchestra strike up the band at a political convention, and arranged garaging when Steve McQueen moved into the hotel with his collection of motorbikes for a long-term stay. And he's become mates with others who've stayed long-term at the Beverly Wilshire, including Elton John, Mick Jagger and Andrew Lloyd Weber, while most members of the British Royal Family, the Dalai Lama, Aga Khan and Japanese Emperors have all propped there and rubbed shoulders with him. And Hollywood made parts of Pretty Woman with Julia Roberts at the hotel, although the Presidential Suite seen in the movie was actually a replica built in a Hollywood studio. A few years back, Ron decided to move on, becoming Director of Sales (Middle East) for LA's equally-grand Beverly Hills Hotel. And I reckon that with his diplomatic skills he's just the bloke who one day will announce when he's got both sides to end the war in Iraq. Which is why I'm trying to get him to write that book. 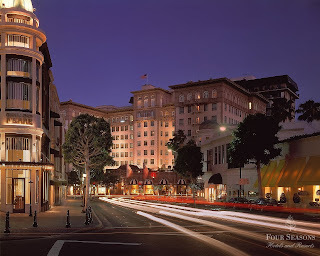 LA's best-known address, the Regent Beverly Wilshire Hotel on Rodeo Drive. 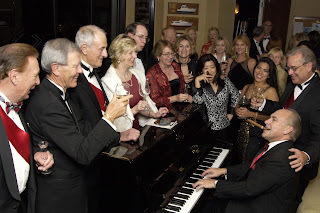 "AMBASSADOR" Ron Howard hams it up at the keyboard during an Epicurean Society dinner at the hotel. Low forward bookings and increasing operating costs are behind the decision to withdraw the Great Barrier Reef cruise ship Fantasea Ammari from service on the eve of Australia’s peak holiday season. Reservations manager Matt Raymant said the 68-passenger ship also needs some ‘unplanned basic maintenance’ and will go into drydock after its final voyage for the year on October 31. Fantasea Ammari is the former Rivage St Martin that was built by the Austal shipyard in Western Australia. It was bought by family-owned Brisbane-based Riverside Marine from Ustica Lines in 2006 and has been operating three- and four-night cruises from Hamilton Island. Raymant said that Riverside Marine, which also owns the day cruise operation Fantasea Cruises and the Reefworld pontoon, plans to launch new itineraries for Fantasea Ammari in the New Year. ‘We are looking at new destinations on the east coast of Australia,’ he said. IT had all the makings of a Hollywood block-buster: a wild and stormy night, a shipwreck and the captain going down with his vessel, and just two survivors – a beautiful young girl and a handsome young man washed ashore to the sanctuary of a cave on one of the most treacherous stretches of coast on earth. But despite all this it lacked the most vital of all for Hollywood – there was no romance. And the reason was that 18-year old beauty Eva Carmichael was a daughter of 19th century British aristocracy, while handsome Tom Pearce was a mere apprentice seaman. The tiny 1700-tonne clipper ship Loch Ard was almost at the end of a 3-months voyage from England to Melbourne when, at dawn on June 1 1878, she ran aground in heavy fog and wild seas on Mutton Bird Island near Victoria's Port Campbell. Her captain, George Gibb had battled for hours to keep her clear of the island, and when she finally struck many of the seventeen crew and 37 passengers – who just hours before had ended a party celebrating the virtual end of their long journey at sea – were killed by collapsing masts and spas, that also prevented ship's boats from being launched. Within ten minutes the Loch Ard had rolled on her side, sinking with all on board except Eva Carmichael and Tom Pearce. Tom managed to paddle ashore on the smashed remains of a lifeboat, and struggled up a beach to shelter from the wind and rain in a cave in a narrow gorge. Soon after he heard Eva's screams in the surf and sighted her clinging alternately to a chicken coop and part of a ship's spa. By now she had been in the water five hours, and after swimming to her rescue Tom dragged her to the safety of his cave. Then in still-pouring rain he climbed to the top of the cliff and miraculously bumped into two workers from a nearby sheep station. After he blurted out his story the men gathered blankets from their homestead and with Tom raced back Eva who, clad only in a wet nightdress, was now semi-conscious and suffering hyperthermia; the young apprentice seaman insisted in carrying her himself to the homestead, where they spent several days recuperating. Upon hearing their story the Melbourne media went into near-frenzy; Tom received a hero's reception including a gold watch from the State Governor and the first Gold Medal from the Royal Humane Society of Victoria – while hundreds openly prayed for romance to blossom between Tom and Eva. The story of Tom and Eva is told nightly in Shipwrecked, a sound and laser show at the Flagstaff Hill Maritime Village at Warrnambool, near western Victoria's world-famous Shipwreck Coast, a disaster zone that since European settlement has claimed an astonishing 700-something vessels. The nightly show is not only a gripping tale in itself, but remarkably is projected onto a huge wall of water rather than a screen; the Maritime Village also incorporates an original lighthouse and light-keeper's cottage, replica shops, a sail-makers workshop, an historic shipping agency office, an old bank, chapel, Masonic Temple and a cosy Tea Room that serves the most wonderful traditional Devonshire Teas. Numerous artefacts from many of the shipwrecks along the neighbouring coast are on display in the Museum – look out in particular for a spectacular 1.5m high porcelain peacock that survived the sinking of the Loch Ard, and floated ashore unscathed in its wooden crate two days after the tragedy. GETTING THERE: WARRNAMBOOL is on the Great Ocean Road, 260km south-west of Melbourne. Bookings for the nightly Shipwrecked Sound & Laser Show are essential; for information phone 1800 637 725 or (03) 5559 4620. 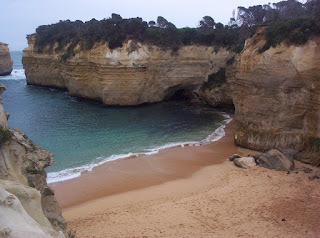 It's also an easy drive to Loch Ard Gorge in which Tom and Eva initially sheltered in their cave. LOCH ARD Gorge was anything but picturesque and tranquil on the wild and stormy night that claimed the small clipper ship after which she is named. 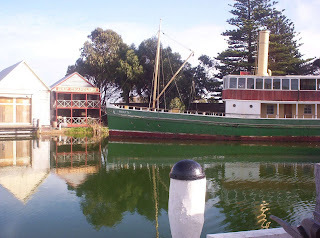 FLAGSTAFF HILL Maritime Museum is a working village that takes visitors back in time. EXHIBITIONS ashore and afloat have something of interest for those of all ages.